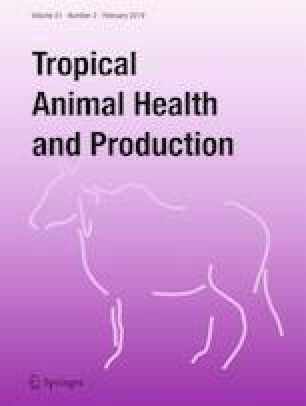 The aim of the study was to determine some ergonomic parameters of donkeys administered with Pycnogenol® (PYC) and subjected to packing during the hot-dry season in northern Nigeria. Fifteen donkeys served as experimental subjects. Group 1 (n = 5) donkeys were subjected to trekking only (control), group 2 (n = 5) donkeys were subjected to packing (P-PYC), and group 3 (n = 5) were administered with PYC (10 mg/kg) and subjected to packing (P+PYC). Each group covered a distance of 10 km. Some ergonomic parameters were evaluated. The duration of work in control, P-PYC, and P+PYC donkeys were 170.0 ± 10 min (2.8 h), 126.6 ± 6.7 min (2.1 h), and 112.0 ± 3.9 min (1.9 h), respectively. The energy expenditure obtained for P-PYC group (88.3 ± 9.8 KJ/s) was significantly higher than the values of 28.3 ± 3.7 KJ/s and 73.5 ± 9.9 KJ/s obtained in control and P+PYC groups, respectively. The output was significantly higher in P+PYC group with the value of 5263.2 ± 135 m/h. In conclusion, packing the donkeys during the hot-dry season was stressful; however, PYC may have served as a potent antifatigue agent to reduce the stress. This research was partially supported by University of Ilorin, Ilorin, Nigeria. All procedures performed in the study involving animals were in accordance with the ethical standard of Ahmadu Bello University Committee on Animal Use and Conduct. Roy, J., Galano, J., Durand, T., Guennec, J. L. and Lee, J. C., 2017. Physiological role of reactive oxygen species as promoters of natural defences, The FASEB Journal, https://doi.org/10.1096/fj.201700170R. Schoonees, A, Visser, J., Musekiwa, A. and Volmink, J., 2012. Pycnogenol (extract of French maritme bark) for the treatment of chronic disorders (Review), Cochrane Data Base of Systematic Reviews, https://doi.org/10.1002/14651858.cd008294.pub4. Watson, R. R., 2017. Pycnogenol® and cardiovascular health, Evidence-Based Integrative Medicine, https://doi.org/10.2165/01197065-200301010-00006.